Ladies and gentlemen, this is your captain freaking. 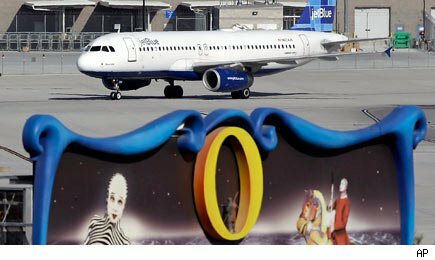 A Tuesday morning JetBlue (JBLU) flight taking passengers to Las Vegas had to be diverted after the pilot had a mental meltdown and had to be subdued by passengers. Reports indicate that the captain was acting erratically in the cockpit, and the co-pilot was able to persuade him to leave. When the co-pilot and an off-duty JetBlue pilot managed to lock him out of the cockpit, the situation intensified. The locked-out pilot began telling passengers that terrorists were going to take the plane down. He was restrained by several of the passengers with seatbelt extenders. JetBlue is initially calling this a "medical situation," though one has to wonder what it would be classified as if it were a passenger inciting the calamity. Either way, this is another bizarre situation on a JetBlue flight. JetBlue has been able to set itself apart from many of the larger legacy carriers through its cheap flights and fancy frills. Passengers have personal monitors giving them access to 36 DIRECTV (DTV) television channels and most of Sirius XM's (SIRI) satellite radio stations. At a time when most carriers are charging for on-board items, JetBlue passengers have complimentary snacks including crackers, cookies, nut mixes, and the signature blue potato chips. Unfortunately, passengers have been getting a little more entertainment than they signed up for on some flights. Two years ago, a fed-up flight JetBlue attendant publicly quit after an altercation with a passenger. He grabbed a beer, opened the emergency chute on the plane parked on the Tarmac, and slid his way down to "take this job and shove it" infamy. Flight 504 last year was grounded on the tarmac for seven hours without food, water, or working toilets last year. "We can't seem to get any help from our own company," the pilot told airport officials at one point as passengers began to grow unruly. "Take us anywhere." In 2005, faulty landing gear forced the crew of JetBlue Flight 292 to circle around for three hours to consume fuel before attempting a bumpy landing. Many of the passengers didn't realize the gravity of the situation until they saw their plane live on CNN -- through the DIRECTV feed in their personal monitors. This should be a good time for JetBlue: Its stock has been trading in the single digits since mid-2007. Analysts see earnings soaring 79% this year off last year's depressed bottom-line showing, and those same pros see JetBlue's revenue inching 11% higher. But the carrier keeps finding itself at the wrong end of the headlines. If it becomes the airline that passengers associate with crews that snap, what will that do to future bookings? It also doesn't help that JetBlue has missed Wall Street's profit targets in two of its past three quarters. Owning the stock has been a lot like being a passenger of Flight 504 last October. The stock just isn't moving. "We can't seem to get any help from our own company," shareholders may be saying. "Take us anywhere." Longtime Motley Fool contributor Rick Munarriz does not own shares in any of the stocks in this article. The city of Palm Bay's largest employers include several manufacturers of durable goods -- a sector notorious for being among the worst when it comes to paying women equal wages -- or hiring them. According to the Department of Labor, only 1.5% of operating engineers and other construction equipment operators are women, one of the lowest rates among all occupations. Among those durable goods firms are semiconductor maker Intersil, electronics manufacturer MC Assembly, defense technology company DRS Technologies, and the Melbourne-based communications equipment company Harris. Interesting note: The Palm Bay metropolitan area is completely out of step with the rest of Florida, which overall has the lowest rate of pay inequality in the country. Two other sectors with some of the worst gender income gaps are also among this region's largest employers: the health services and social assistance industry -- in which women earn just 71.8% of what men do -- and the consumable goods sector, which pays women, on average, 73.8% of what men get for the same jobs. Some of the largest employers in the area are Lehigh Valley Hospital and St. Luke's Hospital, chemical company Air Products & Chemicals and energy company PPL, according to the Lehigh Valley Association of Realtors. The area is also home to a number of large food producers, which are included in the nondurable goods sector. By state, Idaho ranks 39th for earnings inequality by gender. Chattanooga is home to a particularly large manufacturing industry. According to the city's website, the largest manufacturing employers in the metropolitan area are McKee Foods Corporation, Synthetic Industries, and home appliance company Roper. Colorado Springs' economy is built on health care, the military, tourism and the high-tech industry. The city's two largest employers are Memorial Health System and Penrose-St. Francis Health Services, and among its other large employers are high-tech manufacturer Atmel, defense contractors Northrop Grumman and Lockheed Martin, and communications company Verizon Business. While Colorado Springs does poorly, Colorado overall does relatively well, ranking 13th among all states when it comes to equal pay. This metropolitan area is one of the wealthiest areas in the country, with a median household income of $74,831. The national average is $50,046. Disparity, however, affects the wealthy just as much and women in the area earn just 71.8% of what men do, on average. The area's largest employment sector is health care, with Bridgeport Hospital and St. Vincent Medical Center the two largest employers. Although there are many more women than men in the health care and social assistance sector, men's salaries are significantly higher. Bridgeport is also a major center for investment management companies. UBS employs 4,000 people in Stamford - the largest amount in the region. The finance sector is the absolute worst industry when it comes to income inequality between the genders. According to the Augusta Convention & Visitors Bureau, the largest industries in the area are health care, the military and manufacturing. The top employers in the city are the nuclear reservation Savannah River Site, the U.S. Army Signal Center and Fort Gordon, and the Medical College of Georgia. Among the Toledo metropolitan area's largest employers are ProMedica Health Services, Mercy Health Partners, and Chrysler Holdings, which built its Toledo Assembly Complex in the city. The city's largest industries are manufacturing, health services, and education. Government, education, and manufacturing are this metropolitan area's largest industries. Public administration and manufacturing are both highly imbalanced sectors when it comes to gender pay equality. The city of Ogden's largest employers are the Department of Treasury, Weber State University, automotive safety product manufacturer Autoliv, and McKay Dee Hospital. Utah, on the whole, performs poorly compared to other states with regards to equal pay, ranking third-worst in the country. On average, a woman working full-time doesn't even earn two thirds of what her male counterpart earns in the Baton Rouge metropolitan area. According to the Baton Rouge Area Chamber, the city's largest employers are industrial construction company Turner Industries, the Louisiana State University System, engineering, procurement, and construction conglomerate Shaw Group, and industrial contractor Performance Contractors. Although LSU is an outlier, the other companies paint a picture of an industrial-leaning economy. The state of Louisiana also has the nation's greatest pay disparity overall, with women earning 67.2% of what men do.